Whether you’re clearing up a construction site, demolishing a building, extending a property or simply clearing out the clutter from your home, you’ll be left with a large quantity of waste. By far, the most straightforward way to dispose of your waste is to use a skip bin hire service. With a skip bin, you don’t need to let waste occupy space on your property. You can fill it at your leisure as and when required. Better still, you can let our rubbish removal specialists get rid of the waste so that you can concentrate on more pressing matters. At Ultra Bin Hire & Demolition, we’re a leading company for skip bin hire in Melbourne. We cater to the needs of domestic, construction, industrial and commercial clients. With skips in a broad range of sizes, we have the perfect solution for you. We guarantee prompt deliveries and competitive prices, and we take our green initiatives seriously. If you want to do your part for the environment while removing the stress from waste disposal, give us a call. Our skip bins range in size from four to 25 cubic metres. This means that no matter how much waste you have, we can remove it in just one trip. Our largest skips are perfect for demolition sites and construction yards, while our smallest skips are more suitable for extensions, home renovations and clear outs. We understand that choosing the right skip can be challenging. Our friendly team are here to offer recommendations. Just give us a call, detail your needs and the task at hand, and we’ll be able to tell you which skip you need. We may recommend ordering a slightly larger skip than you think you require because transporting overfilled skips is against the law. If you don’t have enough time to fill your skip, you can always hire our operatives to do the hard work for you. This will allow you to concentrate on what you do best rather than waste management. We’re also qualified to remove asbestos and handle site cleanups. There really is nothing we can’t do here at Ultra Bin Hire & Demolition. 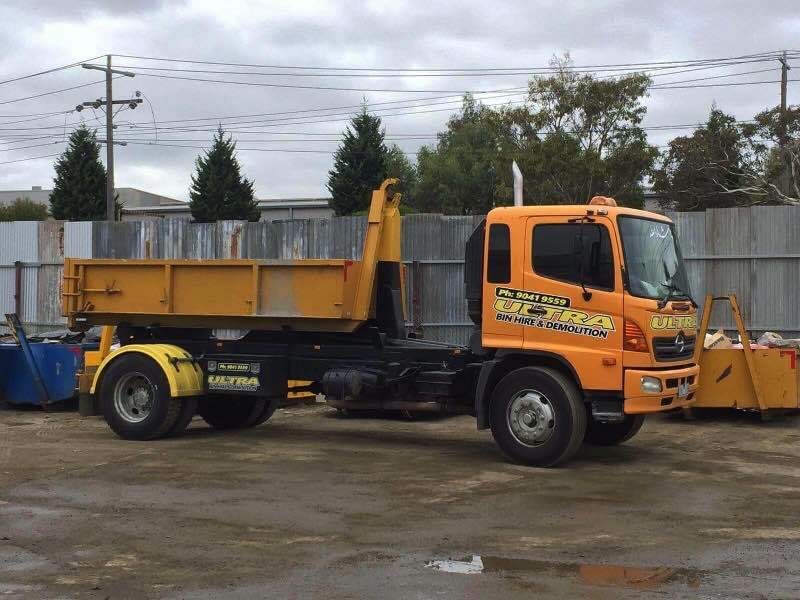 Whether you’re looking for skip hire in Melbourne northern suburbs or the CBD, we’ve got you covered. If you require any permits to place a skip on a road or public area, we can liaise with the relevant authorities for you. We make the entire process as straightforward as possible. Melbourne is a growing city, which is why construction work takes place just about everywhere continuously. Fortunately, because we have so many skips available, we’re always prepared to deliver the skip you need at a moment’s notice. Though we tend to provide skips for a specific length of time, we can always provide extensions on request because we understand that setbacks and delays can’t always be predicted. Should you fill your skip faster than expected, our experienced professionals can retrieve it and replace it with an empty one, ensuring nothing holds up your project. The next time you need skip hire in Melbourne or anywhere around the city, you needn’t look any further than Ultra Bin Hire & Demolition. We’re a waste management company that takes our green initiatives seriously. When you choose us for skip hire, you can feel confident that we won’t simply throw your waste into a landfill. We salvage as much of your waste as possible to protect our finite resources and reduce our carbon footprint. Moreover, we’re familiar with government and EPA regulations and aim to be our industry’s standard-setter when it comes to green disposal. So, if you want your waste disposed of responsibly without having to do any of the hard work, we’re the company to call. Contact our friendly team today to get the best prices and advice for your bin hire. We do not publish rates as our bin hire rates are ultra competitive and we want to make sure you get our best price for your project. At Ultra Bin Hire & Demolition, we are widely known in Melbourne for providing a reliable and cheap bin hire service. To prove our commitment to affordability, we’ve made it easy for you to obtain a free quote online. Simply provide us with your name, delivery date, contact number, address and bin size, and we’ll give you a free quote. We’re happy for you to compare prices with other vendors so that you can find out for yourself how cost-effective we are. If you’re unsure of which bin you require or want to speak with one of our professionals, contact us on 03-90419559. Bobcat Work – With expertly trained operators and the latest equipment, we can assist with Bobcat work for a range of projects. Excavation – Our excavation services are ideal for preparing your site for construction. Whether you need help levelling a slope or digging a basement, we’re the team to call. Demolition – We pride ourselves on offering residential and commercial demolition services that are second to none. We aim to complete every job efficiently without compromising on quality. Asbestos Removal – Need help removing asbestos? We offer safe and professional asbestos removal for residential and commercial properties using the latest techniques and equipment. Rubbish Removal – Hard rubbish services or local skip hire in Melbourne. We have various options available when it comes to rubbish removal. Site Clean ups – We can help improve the safety of your site with our comprehensive site clean up services. Whether you’re moving homes or changing offices, we’re confident that we can help you out when it comes to rubbish skip hire in Melbourne. Click on the quote button below to request an accurate estimate, or give us a call and we’ll discuss the next best step to take for waste bin hire.